Water retention, also called fluid retention, dropsy or edema, refers to an excess of fluid in our body. Fluids can accumulate anywhere in the body, usually in internal organs, tissues and cavities. Water retention can be minor and not pose serious health risks, or it can be severe, in which case it becomes visible and problematic. Swollen feet, ankles or hands, puffiness of the face, belly fat that doesn’t seem to go away even with intense physical exercise are all signs excess water or fluid in general has built up in our body. Where does water retention occur? 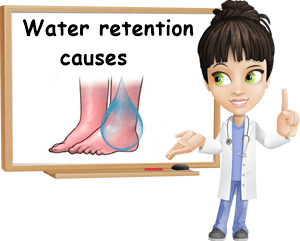 Water retention is most common in the legs and feet, but it can easily occur throughout our body, in our arms, hands, abdomen, face, internal organs and so on. Swelling in general, unless caused by injury or clearly delimited, is a sign of water retention. Normally, our kidneys are granted with the task of eliminating excess fluid from the body. However, errors may occur while our body makes use of fluids, which leads to them not being retrieved entirely to be excreted by our kidneys, resulting in water retention. How does water retention happen? Our digestive system extracts nutrients such as vitamins and dietary minerals from food and passes them into the bloodstream. Nutrients (and oxygen) go from the largest blood vessels to the smallest, the capillaries. Our capillaries ensure the nutrients and the fluid they transport them into pass onto our organs and tissues, to feed the cells there. Normally, the fluids should return to the capillaries after having fed our cells. However, our capillaries don’t always manage to retrieved the fluids, which are left in the tissue space where they may accumulate and lead to fluid retention. There are multiple reasons why this happens: changes in pressure or other problems with the capillaries, too much fluids to begin with etc. can all cause water retention. Our lymphatic system may also intervene and help take the excess fluid back to the bloodstream, but it too may be overpowered. 1) Heart failure. Congestive heart failure is a condition in which the heart can no longer contract with the same force which means it cannot keep up normal blood flow for various body functions. This translates into changes in pressure which promote the retention of fluids. The reason why it’s called congestive heart failure is because it is accompanied by congestion, or excess fluid accumulating in the veins and tissues, often leading to swollen legs and feet, but also lung edema and water retention in the abdomen. Heart failure is a serious medical condition and requires immediate medical attention. Varicose veins and blood clots may also lead to edema. Also see Swollen Feet: Causes, Symptoms and Remedies. 2) Kidney failure. Kidney failure means our kidneys can no longer filter toxins from the blood and excrete fluids properly, resulting in excess fluids and toxic or waste material building up in our body. Fluid build up will appear in the form of swollen legs, feet, puffiness and other markers of water retention. Kidney failure requires the immediate attention of a medical professional. 3) Medication. A number of pharmaceuticals list water retention as side effect. Contraceptives, corticosteroids such as cortisone, beta blockers, hormone replacement therapies, pain relievers such as ibuprofen, paracetamol or aspirin can lead to fluid buildup in tissues. 4) Lack of physical exercise. How does sedentarism, the lack of physical exercise, cause water retention? Physical exercise makes blood circulate to the heart and back and supports the activity of the lymphatic system. When we don’t move even for several hours, blood tends to stagnate in the lower limbs, putting pressure on our capillaries (smallest blood vessels). The capillaries may not be able to hold too much fluids for too long, so they may release at least part of them into the spaces between tissue, encouraging swelling and water retention. Effects are much more pronounced in cases of disability, injury or disease promoting long-term bed rest etc. The lack of physical exercise affects the lymphatic system as well, which may not be able to help retrieve excess fluids from tissues either. 5) Pregnancy. The weight of the growing baby may put pressure on the lower limbs and the largest veins in the lower half of the mother’s body. The pressure will often lead to fluid accumulation and swelling, causing swollen feet and swollen legs. Fortunately, the symptoms are reversible and the swelling should pass once the baby is born. 6) Protein intake. A poor protein intake from dietary sources can result in fluid retention in tissues. You may have noticed that a protein-rich diet often requires us to drink more liquids so we can have regular and easy trips to the bathroom. This is because protein attracts water. Having a sufficient dietary intake helps draw water from tissues and discourages fluid buildup. 7) Vitamin and dietary mineral deficiencies. Vitamin C deficiency puts us at risk for inflammation. The role of inflammation is to signal a problem, a threat, and encourage white blood cells to come to the rescue by creating space for them to move in the body and reach the site of the infection. But that very space allows for fluid buildup as well, encouraging water retention. Other nutrient shortages that may promote water retention include B vitamins, potassium and magnesium deficiencies. For example, potassium neutralizes sodium effects and helps maintain fluid balance within the body, directly affecting blood pressure. Good blood pressure means that blood won’t pool and overpower the capillaries which can then leak fluids into tissue space causing fluid retention. Magnesium is best at regulating muscle activity and, in this particular case, ensuring the heart contracts properly so it can pump blood as it should, again, preventing water retention. B vitamins deficiency may also promote water retention. 8) Excess sodium. Too much salt or sodium in our diet will attract more and more fluids and encourage water retention. An excessive intake of sodium may cause ‘water weight’ which is the inaesthetic buildup of fluids in tissue. Water weight is a common aestehtics problems for people who want to sculpt their bodies and achieve a good muscle definition. They often cannot achieve their goal up until they regulate their sodium intake and manage to get rid of fluid buildup. 9) Other causes. Other causes for water retention include smoking, consumption of alcoholic beverages, thyroid problems, allergies (due to the release of histamine which encourages inflammation), wearing tight clothing or high heels, air pollution etc. 1) Swelling and the feeling of being heavy, swollen or large. 2) Bloating and abdominal swelling. 3) Swollen feet and legs. 4) Swollen arms and hands. 6) Unexpected and inexplicably fast weight gain. 7) Poor excretion of fluids. 8) Joint pain and stiffness (accompanied by swelling). 9) Clothing, shoes and accessories such as watches, necklaces, bracelets, rings become too tight. The symptoms listed above are not exclusive to water retention and other causes should be investigated as well. These symptoms are not harmless signs for us to look for and do nothing about. With the passing of time, the excess fluids overflooding our tissues may lead to side effects such as joint pain and stiffness in ankles, and wrists, knee pain, aches and tender arms and legs, weight gain, high blood pressure, high pulse rate, poor muscle definition, overall feeling of unwell, skin discolouring. Edema may affect the lungs, eyes and brain. 1) Drink sufficient water. Drinking enough water stimulates diuresis and encourages the kidneys to excrete excess fluids (and toxins), preventing fluid buildup. However, too much water promotes the excretion of valuable nutrients, particularly magnesium, a mineral we need for maintaining a healthy heart and preventing fluid accumulation in tissues. 2) Reduce salt intake. Managing our salt intake will help us prevent not only water retention, but a wide range of other conditions and diseases such as inflammation, hypertension and other cardiovascular problems. Find out more about High Blood Pressure: Symptoms, Causes and Treatment. The best way I manage my sodium intake is by eating mostly home cooked meals and food I prepare myself so I know how much salt I eat after all. 3) Exercising. Mild physical activity which is simply staying active can be pleasant (bike ride, walking the dog in the park, hiking, dancing, playing a sport with friends) and stimulate blood flow to help prevent fluid buildup. Moving our toes from time to time, raising our legs occasionally, taking breaks from sitting at the desk or in the car can also help. In my opinion, massages are another great way to stimulate blood circulation. 4) Reduce caffeine intake. While it may not contribute directly to water accumulating in our tissues, caffeine indirectly promotes water retention by increasing our risks factors. One way it does so is by encouraging vitamin and mineral deficiencies. 5) Herbal teas. Drinking teas, particularly diuretic ones, can help prevent and treat water retention. Dandelion infusions are great, but fennel seeds, nettle, hawthorn and many others are great options as well. See Properties and Benefits of Dandelions. 6) Dietary supplements. Vitamins and minerals keep our body in great shape. Having the necessary amounts is often difficult, but can be achieved with the help of dietary supplements. If we aren’t meeting our demands of certain nutrients such as vitamin C, magnesium or potassium, we could do so by taking some quality supplements. Conclusion. Water retention isn’t just an aesthetical issue, it’s a health issue first and foremost. When our tissues become unnaturally saturated with fluid, we risk problems throughout our body simply because normal mechanisms are either inhibited or hindered and we fall behind on being healthy and feeling good. For this reason it is important that we address it properly and make efforts to improve those aspects of our life that promote it. A very full-formed explanation of edema. Thank you, Shankar. Wishing you lots of health!